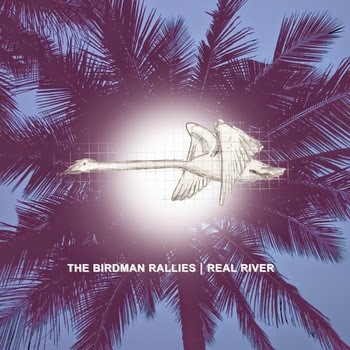 The Birdman Rallies have released their fifth album, Real River. This album is a creative festival of different styles, starting with Dissolve Into The Black, a vibrating electronic kick drum thumping, with layers of other electronic gadgetry to impose the lyrical content neatly. A Little Of Your Glitter swings into indie guitar mode in great portions, while the song deals with wanting that sparkle we have surrounding us. Getting nice and mellow in Vampire, just don't venture out in the sunlight otherwise you'll melt. Though it deals with more of the leeches that inhabit our world. Falling into the mood of the first track, though more harder in the political themed Great Storm Of Now. A clever worded love song in the track Taj Mahal, which features an array of music styles that start with a jazz progression structure, and gets into a sort of pop reggae boogie. It's fascinating that your school sweetheart never seems to leave you throughout life, which is passionately sung in Julia. The next track turns in a one-eighty-degree look at the woman who puts her makeup on, especially the red lipstick in a warrior mode of hunting and fighting with her male counterpart, in the lushful sounding Heartless. Having the same irritation in life as driving on the Ring Road is uniquely put, and the following song On A Corner Overtaking paints a picture of driving through the valley roads, in the sweaty summer months. The tribal sounding track Patrick, deals with not only a good deed by a dear friend but has a romantic angle which isn't reciprocated. The cello plays a crucial part in the introduction to Kitty In Detroit, of not only shacking-up with a girl, but in the once great motorcity capital in the world, however it is now a decaying and crumbling American state, Detroit. Coming to a close is the dub heavy beat of Wild Sisters, which is counterbalanced with strings and keyboard sounds. The song looks at sisters and how they are similar in some ways, and in other ways they are opposite.